DON”T BE JUST ANOTHER ONE OF THE HERD! On Utila you’ll find you have several choices for your IDC experience. All of them with excellent programs yet each one is a little different from the next. I like small, personal classes. No more than 6 students to a class. Plenty of time for theory remediation, practicing that hovering thing one more time, or polishing up your presentation skills. We may even have time for a relaxing fun dive or two. 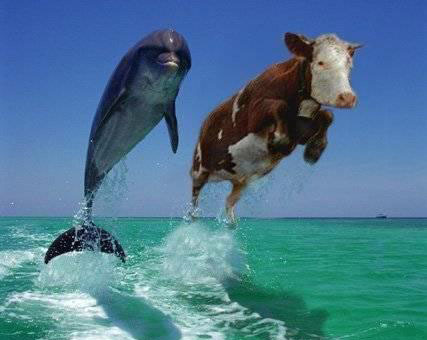 Swim with a bottle nosed heifer. I’ve been a PADI Course Director since the beginning of 2004, an active scuba Instructor, and a full time resident of Utila for about fifteen years. I have the same Platinum Rating that everyone else brags about (except these have MY name on them). I’m a senior hyperbaric Chamber Operator at the only chamber facility on the island. I also train Hyperbaric Chamber Operators. My students teach at and / or manage dive shops / resorts all over the world. I believe in and teach stress free, fun IDCs. You may learn more about Texas than you wanted to but your IE will be fun and rewarding. I’m just a few minutes down the road after you turn left off the dock at Bay Islands College of Diving. Hey Jungle! I just found your blog! Hope you enjoy a salva, or two, for me…. with Ceda and Rob, of course. Hey Jungle…stumbled upon your blog quite by chance…..we enjoyed our stops in Skid Row each n every time!!! Hi to Trish and Dave for us!!!! (we stayed in marina’s house this past month). is this the same jungle gym that was in utila in 1998 during hurricane mitch? you were my instructor, i have the record for the long open water course on the island! haha you should remember me!